A small and lightweight flashlight specially designed to fit subcompact pistols but also works well with many compact and full size handguns. See fitting guide below for specific handgun brands and models. Small size and lightweight that fit many subcompact and full size handguns. Dimension: L x W x H = 1.5in.x 1.5in x 2.0in. This handgun flashlight requires an accessory rail. 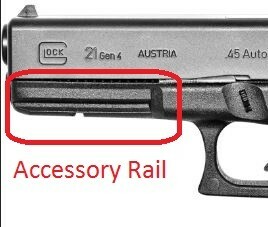 Make sure your handgun has an accessory rail before purchase.